An opportunity exists to simplify the delivery of religious benefits and thereby make them available to those with limited money, education or time. Itinerant preaching pioneered by George Whitefield. Whitefield demonstrated the immense market opportunity for more robust, less secularized religion In doing so he provided the model for itinerancy. If you have no pulpit, what does it matter? Preach anywhere people will gather. Soon scores, then hundreds, and eventually thousands followed in his footsteps, ministering to the nation (53). Revival meetings pioneered by Charles Finney. Finney well knew that to remain healthy, all organizations, be they churches, fraternal lodges, or corporations, must have some means for periodically renewing commitment and that the key to such renewal lies in a sudden intensification of the perceived benefits of belonging ... However, although all organizations need renewals or revivals of member commitment, it also is true that these must be episodic. People can't stay excited indefinitely. Here too the itinerant revivalist offers the perfect solution. When he or she leaves, the revival is concluded, leaving the local pastors to consolidate the gains made during the revival (92). Camp meetings pioneered by Methodist Circuit Riders. Those who came knew what to expect (many had been to camp meetings before) and if they responded with unusual enthusiasm this could be explained by their lack of regular access to worship services and by the duration of the event... American farmers lived on their individual farmsteads. Even in the more densely settled areas, the next farm was a goodly distance away. It was hard to sustain rural churches because so few families lived within reasonable travel distance of one another. Similarly, many farm families suffered greatly from loneliness. Wives often went months without seeing another adult woman and their husbands seldom saw other adult men. (96). The desire of religious consumers. In the model shown below, the normal curve to the right (which is turned on it's side) depicts the desire of people for simplicity in the religious explanations they receive. Those who wish simpler explanations are at the right end of this curve (lower performance) and those who wish more complex explanations are located at the left end of the curve (higher performance). Response by religious providers. Incumbent providers (churches and their ministers) tend to become more sophisticated over time and the explanations they offer (especially if they are seminary trained) will become more complex. That shift is characterized in the rise of the blue line (to higher performance). Eventually their explanations they offer become too complex for the average religious consumer, which leads to a loss of enthusiasm for the message. This process is the equivalent of competing manufacturers of electronic devices adding more and more buttons and controls into their offering until a point is reached where the average consumer is unable to understand or use the device at all. A "disruptive" innovation is possible when an opportunity exists to simplify the delivery in some way that satisfies the consumer with a less sophisticated, but easier to use product or service. 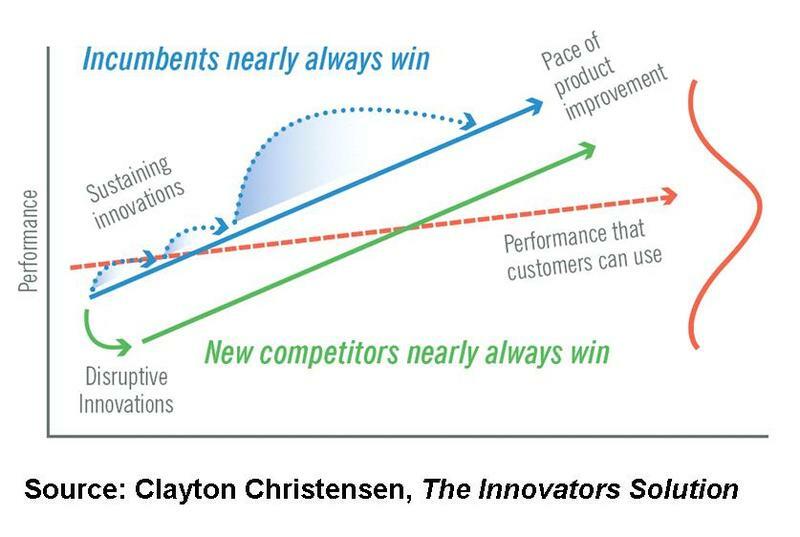 That innovation is depicted in the graph by the downward shift to the green line and the leveling of the dotted-red line, which is directed at the average needs of the consumer. The education and background of the ministers influenced the message they brought and how they delivered it. Perhaps the contrast between faith and theology best conveys the vivid differences between 'called' and educated clergy. Does the religious message address matters of faith that are directly relevant to the experience and concerns of the laity, or is it a discourse on abstruse theological matters? Put another way, is it a message of conversion or a message of erudition? … Neither the Baptists nor the Methodists set forth their confessions in complex theological writing that required extensive instruction or teaching... It is not only content that is involved here, but the style of delivery – Marshall McLuhan might have suggested that in some ways the minister was the message (84-86). Thus far we have minimized the importance of religious factors in religious choices in order to emphasize the importance of social capital. But, in fact, selecting a religion is not exactly like joining a secular club. Belief is the central aspect of religion, and therefore one's beliefs do matter, but in a more subtle fashion than has been assumed by those who attribute religious choices to doctrinal appeal (120). The "popular style and appeal" of the New Light Separatist Baptists in Virginia who's "celebration of the Lord's Supper frequently followed baptism and was a further open enactment of closed community" (Isaac167). The call for "the abolition of organizational restraints of any kind" by the Christian movement so that people could "discover the self-evident message of the Bible without any mediation from creeds, theologians, or clergymen not of their own choosing (Hatch 77, 81). The advocacy by evangelist Phoebe Palmer of the Holiness movement that sanctification is available and obtainable immediately, that it does not require a lifetime of holy living, but is rather available is "an immediate possibility of any believer ... no matter how new in the faith, to seek it as the instantaneous gift of the Holy Spirit" (Gordon 79). The emergence of the publishing industry which was used by the New Thought movement to penetrate the American market by use of tracts, magazines and books with a simple message of health, prosperity and peace of mind; eschewing difficult issues of evil and the social difficulties of maintaining a church. "The drama of health and healing" used by the African American Faith Movement which encouraged believers to "use their bodies, alongside their finances, as the testing ground for their faith (Bowler 84). The simple, four-square prosperity gospel delivered in the Sunday "celebrations" of Joel Osteen and Lakewood Church for "casting a wide net" for potential followers and for minimizing the complexity of maintaining small group interaction. The simple message of concern for the spiritual seeker offered by Oprah in her Sacred Sunday broadcasts. We may assume that the mass gathering of people drawn by George Whitefield had little or no social attachments and that the same would be true of those who came to revival meetings in urban areas. While Methodist camp meetings and the "closed community" of New Light Separatist Baptists certainly had a quality of social adhesiveness, as do the Mormons and members of the Unification church (described in the chapter by Stark and Finke), it remains to be established that the primary opportunity for sects is the formation of social attachments. It may be that one's social attachments functions to support or diminish one's receptivity to a religious explanation (and Stark and Finke would likely agree) rather than being the primary opportunity itself.